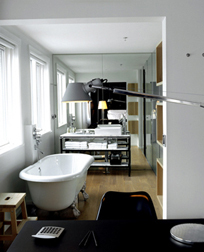 101 hotel in Reykjavik, Iceland like staying at the chic home of a friend, which was the intention of the owner and designer, Ingibjörg S. Pálmadottir. The 38-room and suite boutique hotel in Reykjavik opened in 2003 and incorporates Ms. Ingibjörg S. Pálmadottir's impressive collection of contemporary Icelandic art. A Design Hotel, art is everywhere, from the stalagmite or icicle-like sculpture behind the reception desk, to the carved heads sculptural piece in the entrance, to the library where contemporary paintings line the walls and a large silver sculpture of a man with his head bent stands on a platform like a modern knight returning to the castle after a long day, to the white bubble-like sculptural wall created by the artist Lilja Palmadottir in 101 bar and restaurant. 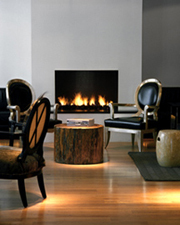 It is a hotel of relaxed, comfortable, elegance where a fire glows invitingly in the library beckoning guests to come and sit in the silver round backed chairs with black leather upholstery while paging through the numerous art books or magazines on the tree trunk coffee table and on the shelves that run the width of the room. 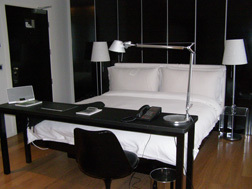 Edward F. Nesta and I stayed at 101 hotel in April 2007 in a lovely room with a minimalist black, white and gray color scheme. A black multi-panel floor to ceiling screen created a dramatic backdrop for the king bed dressed in pristine snow-white luxurious linens, multiple pillows, and fluffy duvet, with an eye-catching charcoal gray Icelandic wool throw casually draped on the duvet. Molded clear acrylic bedside tables held a telephone and an alarm clock. At the foot of the bed, a narrow table ran the length of the bed and acted as a desk that was accessorized with a black gooseneck lamp, Bose IPOD music system, calculator, and telephone, with a black acrylic and black leather chair. The hotel has wireless Internet accessibility, which provided us with the opportunity to use our laptop anywhere in the hotel. A closet hid a Sony Trinitron flat screen television, CD/DVD player, 101 hotel slippers, a mini-bar refrigerator, and a safe large enough to hold a laptop or purchases from the fashionable boutiques along Skólavörðustígur and Bankasræti. White sheer floor to ceiling curtains dressed the wall of windows leading from the bedroom to the long rectangular open concept dressing area and bathroom, which featured an old-fashioned white claw-foot tub with shiny silver feet for luxuriant soaks, and a wooden stool to assist guests in climbing into its vastness. Slate gray robes with the 101 hotel logo hung from the open clothes rack perfect for wearing to use the Jacuzzi or sauna. Stepping onto the heated wood floor each morning when rising, or the heated black marble floor in the walk-in shower with rain showerhead, and in the enclosed toilet, was a joy. An assortment of Aveda amenities and a hairdryer, awaited on the black marble triple level vanity with large white porcelain sink. We began each day by indulging ourselves with an early morning soak in the Jacuzzi located on the lower level of the hotel, where there is also a sauna, a fitness center with the state of the art equipment, and for those looking for a leisure time game, there is a billiards table. In the evening we had cocktails and dinner at the fashionably hot "to be seen" place, 101 bar and restaurant, featuring a yin/yang décor of white and black, with a white sculptural wall in the rectangular dining room, an atrium ceiling, and a large window at the end of the room. The barmen create innovative cocktails at the long black bar, and where bar guests sit at high long tables with tall white stools with round white leather backs. 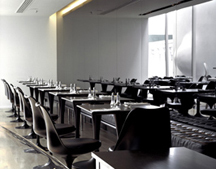 The dining area features a complementary black acrylic wall, black leather banquettes, and black acrylic and black leather swivel chairs, and square black wood. Chef Gunnvant creates modern Icelandic and international cuisine with Indian influences. Two of the delectable selections we sampled included Langoustines with Codfish Roll, and Grilled Fillet of Icelandic Lamb. Located next door to the opera house, across the street from The Cultural House, National Theatre, and steps away from the main shopping street and the 101 gallery, the 101 hotel offers the perfect address for easy walking accessibility. Please read other articles on 101 hotel's 101 bar and restaurant in Restaurants, and Chefs' Recipes sections where Chef Gunnvant shares his recipes in English and in Icelandic.